Nintendo of America president, Reggie Fils-Aime, calls the community's demand for content "insatiable." 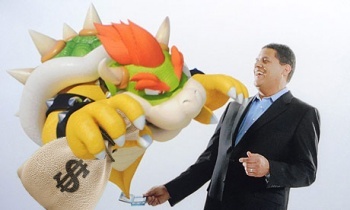 Nintendo is worried that customers can't get enough of Nintendo's products, at least according to Reggie. Fils-Aime. "One of the things that, on one hand, I love and, on the other hand, that troubles me tremendously about not only our fanbase but about the gaming community at large is that, whenever you share information, the perspective is, 'Thank you, but I want more.' 'Thank you, but give me more.' I mean, it is insatiable," he told Kotaku. Among the big three, Nintendo's reliance on its first-party titles is relatively unique. So any Nintendo presentation, even one that details a new console, like this year's E3, is often seen as "underwhelming" if it isn't loaded with appearances from the company's old guard, Mario, Zelda and their ilk. "For years this community has been asking, 'Where's Pikmin?' 'Where's Pikmin?' 'Where's Pikmin?' We give them Pikmin. And then they say, 'What else?,'" Reggie continued. "They say, 'Ho-hum, give me more.' So it's an interesting challenge," he added. Reggie goes on to point out that what the core gaming community often dismisses as banal or dull can often go on to sell millions of units and become a "phenomenon," perhaps highlighting Nintendo's oddly dysfunctional relationship with its "core" fans. "I would argue that the gaming community actually is unable to differentiate between a phenomenon and something that is 'ho-hum... Until they play it," he said. "Until they experience it. Until their friends and their non-gaming associates say, 'Hey, have you seen X?'"